While interviewing for a job at the XYZ company, you find a variety of “cliques.” You ask each group what it’s like to work for XYZ, and you get very different responses. As you ask pointed questions in efforts to determine XYZ’s mission and core values, you get answers that are all over the map with no consistency. Which of the following is likely to be true about XYZ? 1) Product differentiation 2) Diversification strategy 3) Weak culture 4) Competitive advantage 5) Lots of diversity Because it’s clear the values are not widely and deeply held, XYZ has a weak culture. Do you think there is/could be a relationship between a company with many products or extensive diversity and a weak culture? Discuss with your neighbor. 2 ConcepTest: Culture Which of the following is not generally thought of when we look at diversity in organizations? 1) Hair color 2) National culture 3) Age 4) Sexual orientation 5) Functional background Hair color can change, and therefore is not thought of as a stable characteristic likely to impact your work experience. Since we study diversity in organizations because it impacts our work experience, do you think we should consider hair color? Is it something that could alter your work experience? If so, how? Discuss with a classmate. 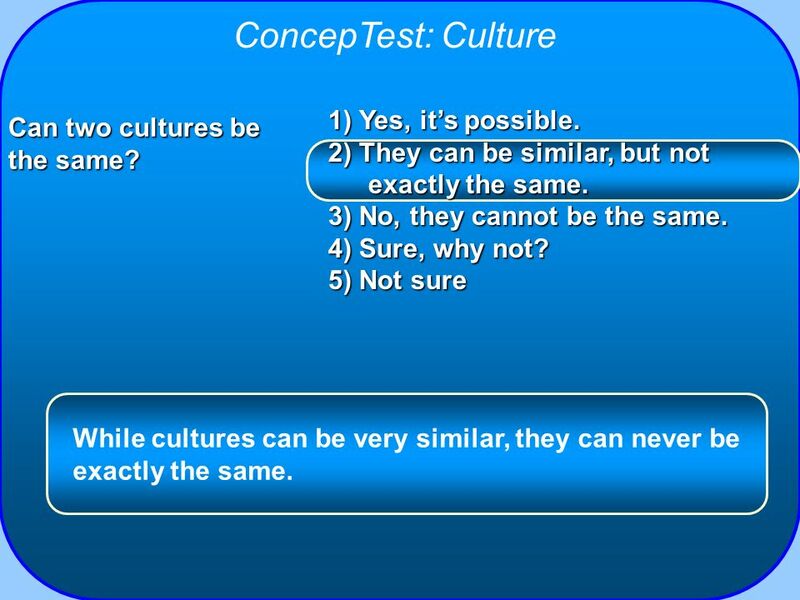 3 ConcepTest: Culture Diversity is believed to help groups and organizations perform better. Which of these are not reasons diversity is believed to be helpful? 1) Serve diverse clients/customers better 2) Increased creativity 3) More solutions 4) Better food 5) Recruiting tool While better food may be present in worker lunchboxes (depending on your tastes! ), we don’t generally make the case for diversity based on this condition. When you are selecting your first job out of college, will a diverse organization be more appealing? Why or why not? Will it be a critical part of your decision? Discuss with your neighbor. 4 ConcepTest: Culture Which of the following does not play a key role in creating an organizational culture? 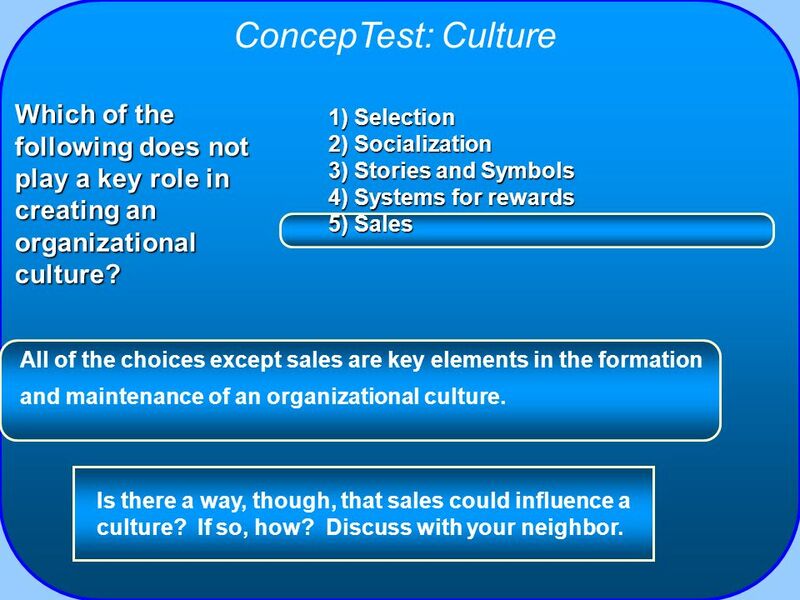 1) Selection 2) Socialization 3) Stories and Symbols 4) Systems for rewards 5) Sales All of the choices except sales are key elements in the formation and maintenance of an organizational culture. Is there a way, though, that sales could influence a culture? If so, how? Discuss with your neighbor. When everyone comes to work at Joe’s Bikes, they are told “Once, a supplier had an emergency and couldn’t get the truck to us until the following Monday. Lisa here rented a truck and went up there and picked up the bolts herself---of course she did---we had bikes to assemble for our Saturday sale.” This is an example of 1) Symbols 2) Stories 3) Reward Systems 4) Selection 5) Performance Evaluation By telling this story to their new hires, Joe’s Bikes is communicating the company values. 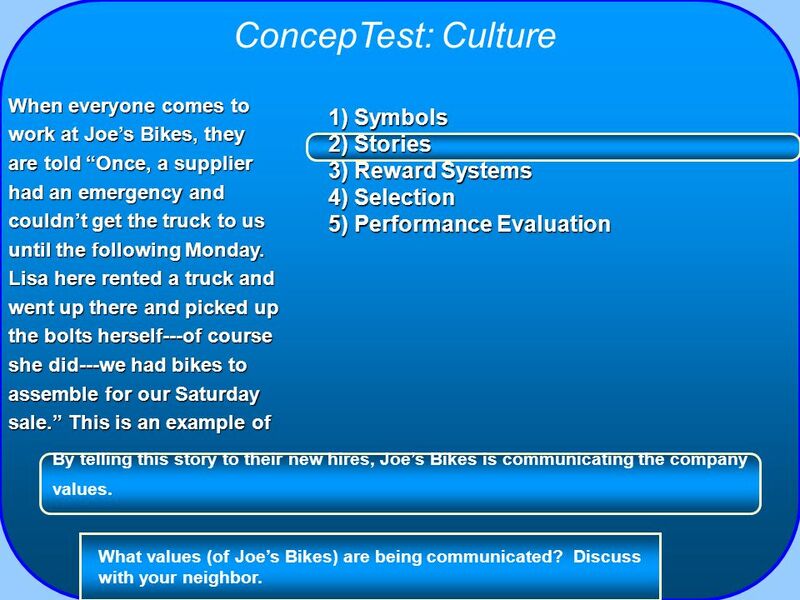 What values (of Joe’s Bikes) are being communicated? Discuss with your neighbor. 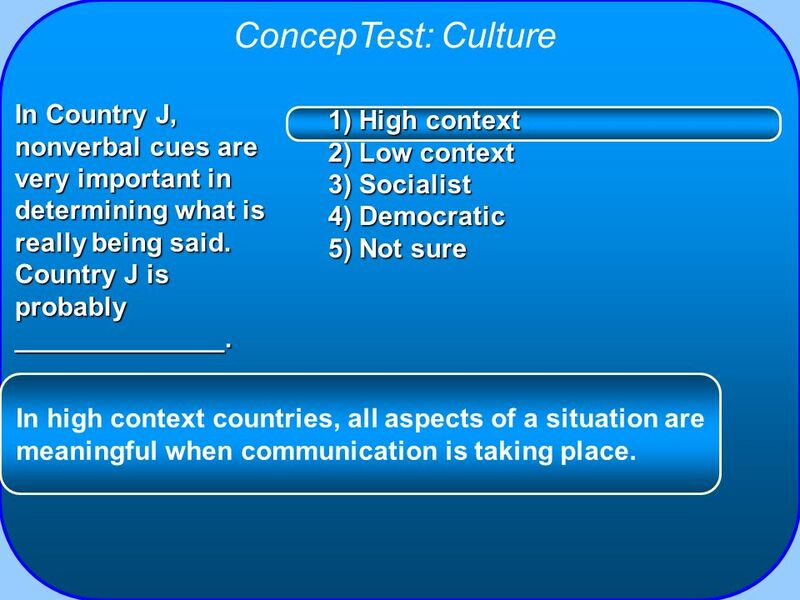 6 ConcepTest: Culture In Country J, nonverbal cues are very important in determining what is really being said. Country J is probably ______________. 1) High context 2) Low context 3) Socialist 4) Democratic 5) Not sure In high context countries, all aspects of a situation are meaningful when communication is taking place. 7 ConcepTest: Culture People in Country Z pride themselves on the fact that what you say is what you mean and what you hear is what is being said. 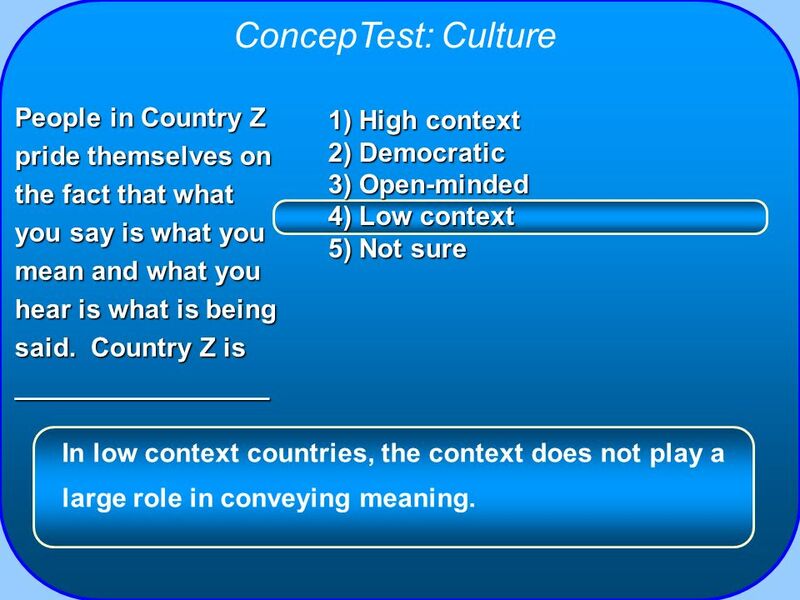 Country Z is _________________ 1) High context 2) Democratic 3) Open-minded 4) Low context 5) Not sure In low context countries, the context does not play a large role in conveying meaning. 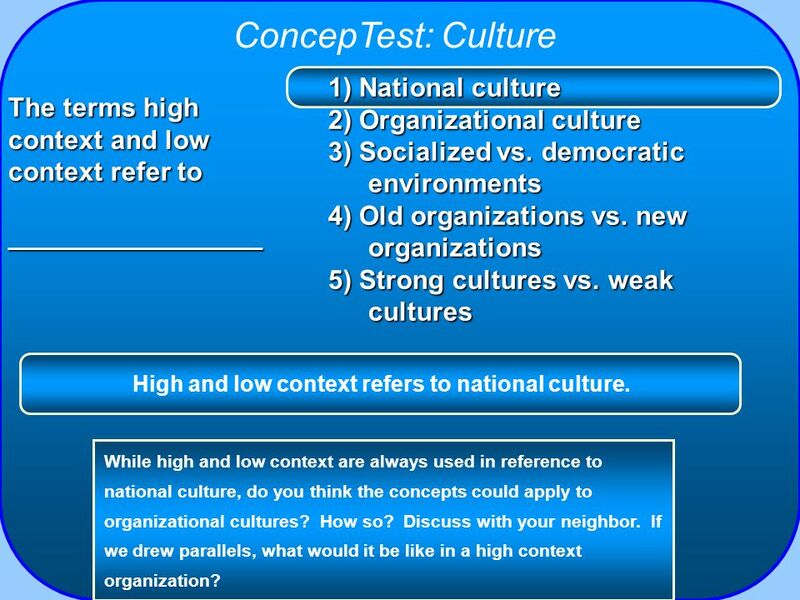 3) Socialized vs. democratic environments 4) Old organizations vs. new organizations 5) Strong cultures vs. weak cultures The terms high context and low context refer to _________________ High and low context refers to national culture. While high and low context are always used in reference to national culture, do you think the concepts could apply to organizational cultures? How so? Discuss with your neighbor. If we drew parallels, what would it be like in a high context organization? Yongliang is an engineer from China. He works for a major aerospace company in the U.S., and has worked for the company for 26 years. If we were to consider his diversity characteristics, how many dimensions would we consider? 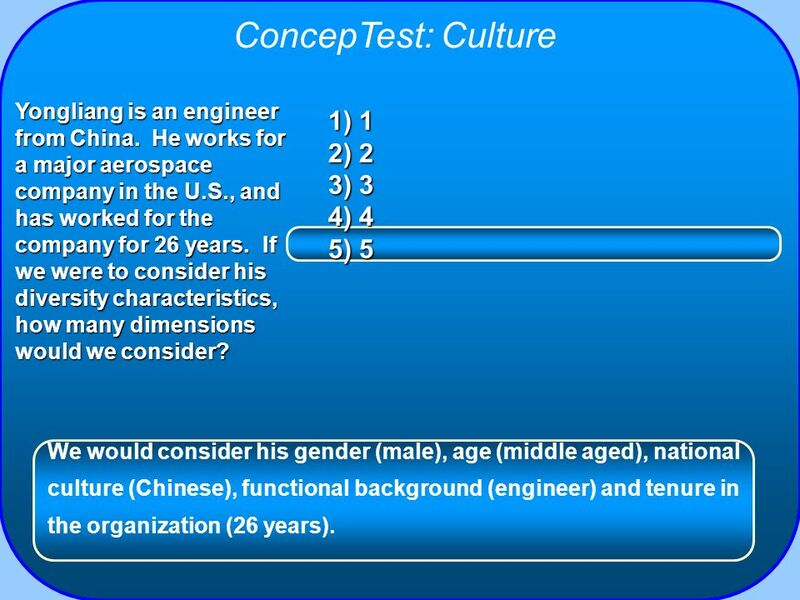 1) 1 2) 2 3) 3 4) 4 5) 5 We would consider his gender (male), age (middle aged), national culture (Chinese), functional background (engineer) and tenure in the organization (26 years). 1) artifacts, values, and assumptions 2) employees, supervisors, and management 3) environment, strategy, and direction 4) values, emotions, and attitudes 5) not sure Culture, overall, consists of artifacts, values and assumptions that, together, are unique to that particular culture. 11 ConcepTest: Culture 1) Yes, it’s possible. 2) They can be similar, but not exactly the same. 3) No, they cannot be the same. 4) Sure, why not? 5) Not sure Can two cultures be the same? While cultures can be very similar, they can never be exactly the same. 12 ConcepTest: Culture When you arrive at your new job, you’re sent to a three-day training class. Because you took a great management class, you know that you are being 1) Socialized 2) Selected 3) Appraised 4) Rewarded 5) Watched Training is way for organizations to socialize their members and to promote the kinds of values and norms they espouse. 1) Widely shared 2) Posted on all walls 3) Deeply held 4) 1 and 2 5) 1 and 3 In a strong culture, core values are widely shared and deeply held. If you walked into an organization and saw its core values posted on every wall, would you suspect a strong or a weak culture? Discuss with your neighbor. 14 ConcepTest: Culture If an organization is trying to promote a new culture, should it give everyone equal pay? 1) Yes, but only if the new culture is one of egalitarianism. 2) No, not if they want to motivate people. 3) No, people should be rewarded based on their effort. 4) Yes, everyone should always get equal pay. 5) No, people should be paid based on their rank in the organization. Compensation systems should reflect the core values of an organization and reinforce desired behaviors. So, if an organization is trying to promote a culture of egalitarianism, it should have little if any variation in pay. Discuss with your neighbor why the answer is 1. Download ppt "ConcepTest: Culture 1) Product differentiation"
Advertising research What makes us buy some products and not others? Why do we prefer some brands over others? Do print ads and TV commercials actually. © 2007 Prentice Hall Inc. All rights reserved. Emotions and Moods Chapter EIGHT. HP Dilemma? Can the sense that the HP Way was “dead” be reversed? Organizational Culture. What People Say… “It was a good job, but I just didn’t fit in.” “The company’s values weren’t my values.” “Everything was just.